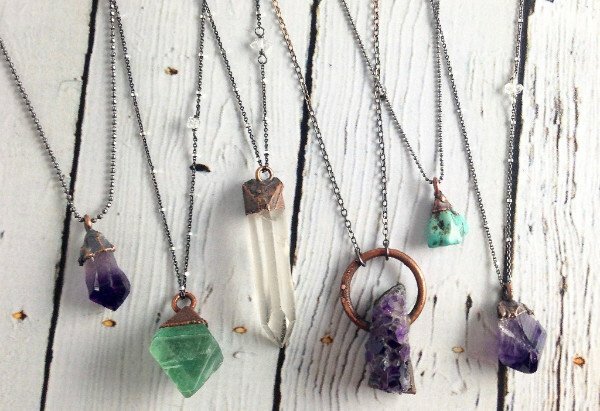 New beauties have hit the shelves from one of our favorite jewelry artists, Hawkhouse Studio. Jessica, the artist, uses semi-precious raw stones in all of her pieces. She attaches them to her chains and stud earrings using a process called electroforming. This makes the stones look naturally formed to the copper piece that holds them onto their sterling silver chains or ear posts. It's so wicked cool. Pop on over to our website to see some of these new beautiful pieces now, or come in to the shop and try some on. Each piece is completely unique. You're going to love these!